Ferox was designed with 360 degrees of omni-directional sound, proving that great things come in small packages. The Razer Ferox delivers room-filling audio clarity with its 360 degree omni-directional acoustics, giving a much wider listening sweet spot than any ordinary front-facing speakers. You no longer need to be glued in front of your speakers to get the best sound –no matter where you stand, sit, or backflip during a riotous shootout, audio from the Razer Ferox sounds just as immersive. The speakers have expandable resonance chambers that provide stronger bass and optimized digital amplifiers for a fuller sound experience, each chamber rises upon a single press to power up. Razer has been designing products with gamers in mind since 1998. They’ve found a great balance between quality, precision and ease of use in all their products. The Razer Ferox is no exception. With 12 hours of rechargeable battery life and a convenient carrying case, the Razer Ferox is extremely versatile. The speakers can also play and charge simultaneously, so you don’t need to worry about running out of power any time soon. 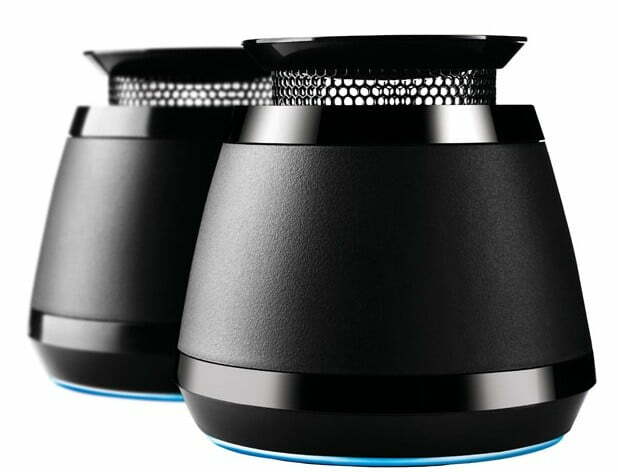 These mobile speakers can be used for space-constrained gaming desktop setups, brought along to LAN parties for a convenient audio solution, or broadcasting your favorite playlist on the go. They work with and media playwe with a 3.5mm jack.